This morning, listening to Diane Rehm, I heard the host ask her guest what President Obama should do to fix the ailing economy. Her guest expert tried to answer, but did not point out that any proposal to address the economy would require passage by the House and Senate. It struck me, again, that our political discourse is consumed by magical thinking. Two large economic problems have dominated the discourse -- the Great Recession, and the long-term deficit. Now, one problem right off the bat is that much of the discussion weirdly fails to distinguish between these two problems, or treats any solution to one as mutually exclusive with the other, when in fact we can pursue policies that increase the deficit in the short run while decreasing it in the long run. But the greater impediment is that we're roadblocked by political disagreement between different bodies that must agree in order to produce any action. On the long-run deficit, President Obama favors a fiscal adjustment based on a mix of spending cuts and higher revenue, ideally through a tax reform that produces lower rates. Republicans believe that a fiscal adjustment is only desirable if it consists entirely of spending cuts. On the Great Recession, Obama favors a variety of short-run policies to increase consumer demand, while the Republicans advocate short-term fiscal contraction. They will approve of some policies that increase short-term deficits, but only if those policies contribute permanently reduce effective tax rates for businesses or high-income individuals. Temporary payroll tax cuts no, but maybe yes if they're paired with longer-term reductions in business taxes or extensions of the upper-bracket Bush tax cuts that increase the probability of making those tax cuts permanent. I personally have some strong opinions on the merits of those positions. But I'm not trying to argue right now about the merits. I'm merely attempting to describe the scope of the disagreement. This disagreement is the key source of gridlock on both issue. You don't have to conclude from this that any progress between now and November 2012 is impossible (though I do personally believe that progress is impossible.) It does not require magical thinking to argue for some innovative strategy to break down or evade the gridlock problem. Yet the vast reams of commentary urging action do not do this. They simply ignore the existing impediments to legislative action. Part of the issue here is the cult of the presidency. We hold the president responsible for everything that happens. The notion that the president and both houses of Congress must agree on most actions in instinctively dissatisfying. And so we think of every problem as a question of "what should the president do." Layered on top of that is a failure to recognize the deep-seated disagreement between Obama and the Republicans over what we should do. There was no word on the mood of the president’s political team, but it was unlikely to be buoyed by the Fed’s assertion that the economy would still be faltering well past Mr. Obama’s second inauguration, should he win another term. Mr. Obama, Mr. Rothkopf argues, has to focus in the next 18 months on getting the economy back on track for the long haul, even if that means pushing for politically unpalatable budget cuts, including real — but hugely unpopular — reductions in Social Security, other entitlement programs and the military. We have a couple problems here. First, an apparent blurring between the response to the Great Recession and the long-term deficit. And second, a framing of the question of the long-term deficit as an issue of presidential character. Obama has repeatedly endorsed proposals to reduce the long-term deficit via revenue-enhancing tax reform and spending cuts. Republicans oppose these plans. What else should Obama do? 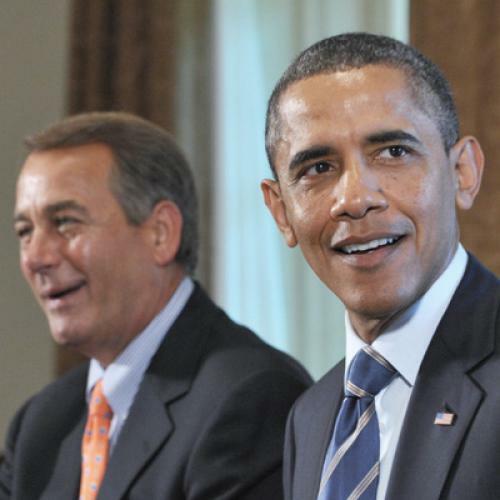 Should he agree to cut the deficit by $4 trillion entirely through spending reductions? Find some previously-unused method to persuade Republicans to alter their most sacred principle? Nobody says. Meanwhile, Tom Friedman writes a column today envisioning a world in which both parties come together. Republicans agree to endorse Obama's policy agenda, and Obama agrees to admit that he could have explained his agenda more clearly. I share Friedman's enthusiasm for such an outcome, but I fail to see how this relates to the current impasse. This is one way in which conservative journalism is actually far more sophisticated than mainstream news journalism. Conservative pundits, while usually slanting their account in highly partisan and often misleading terms, do a fairly good job of grasping and explaining the fact that the two parties fundamentally disagree on the causes of and solutions to the economic crisis and the long-term deficit. In this sense, a Rush Limbaugh listener may well be better informed about the causes of the impasse than listener of NPR or other mainstream organs. The former will have in his mind a wildly slanted version of the basic political landscape, while the latter's head will be filled with magical thinking.